Last month, a dozen New York City singer/songwriters gathered in Brooklyn get their holiday cheer on early. The group’s recording of Tom Petty’s “Christmas All Over Again” will kicks off “A Holiday Benefit, Vol. 4,” a thirteen-track charity compilation benefiting 826NYC. Since its inception in 2007, in “A Holiday Benefit” has raised over $10,000 for the nonprofit organization’s support of students ages 6-18 with their creative and expository writing skills. Two weeks ago, five-year-old Otis Leimbach created an inspired album cover featuring a snowman amidst a colorful, nighttime cityscape. Last week, all twelve acts delivered their contributions to the release, including two beautiful originals (Alex Wong & Rachel Platten’s moving “Make It Home,” and Casey Shea’s plaintive “All I Want For Christmas”), plus covers of classics from artists as diverse as Mike Viola (Zach & Sarah’s poppy “Give Me A Second Chance for Christmas”), Cyndi Lauper (Kelli Rae Powell’s inspired “Feels Like Christmas”) and Stevie Wonder (Chris Abad’s rousing “Someday At Christmas”). On Monday, December 6th, directors’ Kathy Kim and Danielle Owens-Reid will premiere their “Christmas All Over Again” music video. On Tuesday, December 7th, “A Holiday Benefit, Vol. 4” will be available via iTunes. On Thursday, December 16th, we’ll celebrate “A Holiday Benefit, Vol. 4” at Rockwood Music Hall’s Stage II. The charity concert will feature performances from Alex Wong, Bryan Dunn, Casey Shea, Charlotte Sometimes, Chris Abad, Dave Pittenger, Kelli Rae Powell, Rachel Platten, Wes Hutchinson, Zach & Sarah, and myself, plus a silent auction. NY1’s Roger Clark will host with special guest comedian Negin Farsad. All proceeds will benefit 826NYC. Tickets will be $8 in advance, and $10 at the door. Pre-order your “A Holiday Benefit, Vol. 4” tickets now! 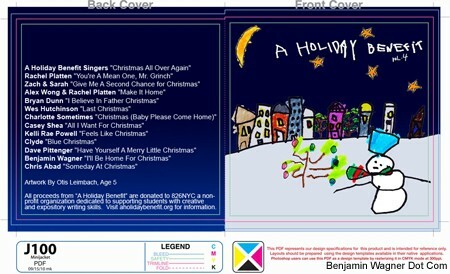 And be sure to download “A Holiday Benefit, Vol. 3”, “A Holiday Benefit, Vol. II” and “A Family Holiday” on iTunes today! 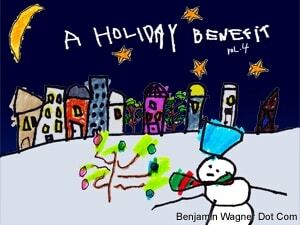 Visit www.aholidaybenefit.org and www.826nyc.org for more information.